Terms & Conditions: New William Hill online customers only. Min. unit stake of £10/€10 at odds of 1/2 or greater. Only the “win” part from EW bets will count. Free bet terms, payment method & country restrictions apply. Free bets credited as 3 x £10/€10. Free bet stakes are not returned as part of the settlement of successful free bets. All Free Bets must be wagered within 30 days. This bonus code will enable you to receive William Hill’s new customer welcome offer. Bet £10, and William Hill will give you 1 x £10 free bets when you use this promo code. 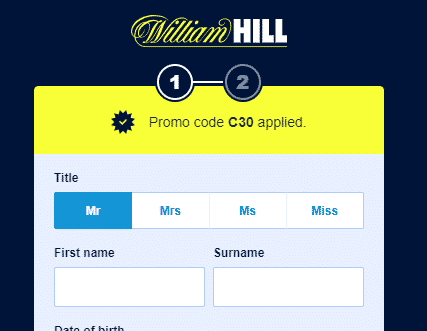 Where Do You Enter the William Hill Promo Code? This depends on which registration form you use. We’ve included both examples. If you visit via My Betting Sites or a similar website, your William Hill promo code will automatically be applied. It will be visible at the top of the registration page. There is no need to do anything further, you will receive the bonus. There is an alternative way to join, which uses an older registration page. If your registration page looks like below, you need to manually input the code. Unless you do so, you will not receive the free bet. Do You Actually Need the Promo Code? On a couple of online bookmaker websites, you don’t need to enter the code. For William Hill, you must do. This code is only for new customers. However, on daily basis, we update our homepage with all of their existing customer offers. Just use the filtering options to find them as we do it for all bookmakers. Here are some good reasons to join William Hill if you don’t have an account already. Well Known and Respected – This betting site is most of the most recognised brands not just in sports betting, but among all companies in the UK. With their high street presence, most towns and almost all cities will have a William Hill. New Customer Offer – Now is a good time to join William Hill as they are giving away free bets to new customers. 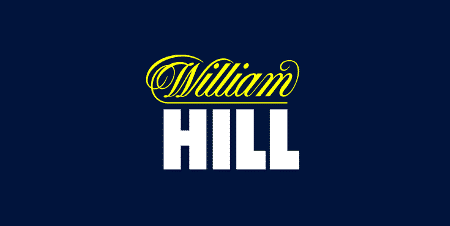 Sponsorships – William Hill gives back to a lot of sports, such as horse racing with their sponsorships. Some sports would suffer if it wasn’t for this. Joshua Anthony is a brand ambassador of William Hill and one of the main reasons why he chose them was due to their association and long-standing support of boxing. Existing Customer Offers – Once you’ve redeemed your welcome offer, that isn’t the end of it. William Hill has ongoing offers for existing customers, such as their ‘2 clear’ and ‘4 means more’ offers. Both pay extra winnings under certain criteria. Golden Goal – For a match each week last month, William Hill awarded you a winner if your backed team scored first. Even if they went on to draw or even lose the match, you still got your cash. Golden Race – Pick the finishing order of horses in a specified race, and you can win £100k. High 5 – Existing customers also got a bonus on ITV televised races. It’s the end of National Hunt racing now, so it’s possible this offer will switch to the ‘2 clear’ offer we have seen before.